Are you looking for convenience and class near the slopes in Park City? 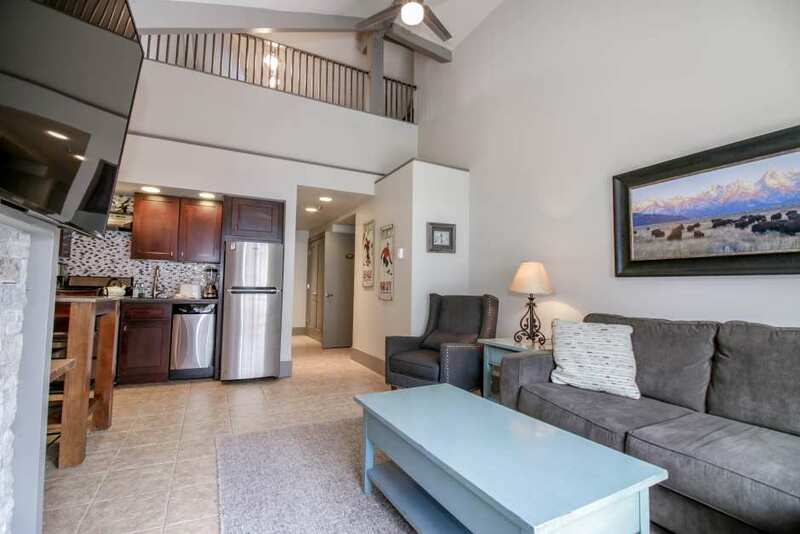 Look no further than this lovely 1BR+Loft unit at the Lodge at Mountain Village. Situated near the main hub of Park City Mountain, it’s just a few steps to the First Time, 3 Kings, and Eagle Lifts as well as the ski school meeting point. You’re right in the thick of the action so you can be one of the first people on the slopes! This 1BR+Loft, 2 bathroom condo has been newly updated and sleeps 4 comfortably, with a king bed in the master bedroom and two twins in the lofted area. Each sleeping area has its own bathroom with shower/tub combo. The updated kitchen is perfect for a small family or group of friends – it boasts stainless steel appliances and an elevated bar-style table with four chairs that leads into the cozy living space, complete with flat screen TV and gas fireplace. As an extra bonus, this unit also has a balcony that overlooks part of the village area. The Lodge at Mountain Village also has a pool and hot tub to complement its amazing location right next to the slopes. There are very few units in Park City proper that offer everything that this unit has – contemporary furnishings, luxe bedding, and the best location to explore one of the top ski destinations in the world!